As a black conservative Tea Party patriot, I have been struggling with what I should do, if anything, in response to the rash of incidents of racial violence resulting from the Martin/Zimmerman case. Folks, a great evil is running the show in our country right now. Even a nut case white supremacist group have thrown their hat, or skinned heads, into the ring, threatening violence. Rather than showing pictures of 6'3” seventeen-year-old Trayvon Martin, nearly every TV news broadcast features pictures of Trayvon as an adorable little boy in his little league football uniform. This is done by design to further the media's storyline: innocent-little-black-boy-murdered-by-evil-racist-white-man. Zimmerman is not white. He is Hispanic. To further the mainstream media storyline, the New York Times has deemed Zimmerman, a “white” Hispanic. I do not know what transpired between George Zimmerman and Trayvon Martin. I do know that the Race Industry has gone to extraordinary, dishonest lengths to promote its innocent-little-black-boy-murdered-by-evil-racist-white-man storyline. Even president Obama despicably and masterfully fueled the flames of racial hatred by saying, “If I had a son, he would look like Trayvon.” As a seasoned professional politician, president Obama surely knew his comment would up the ante of black rage. So yes, as Christian and as patriot, I wondered, what should I do to help calm the storm of Martin/Zimmerman related racial violence? Should I rally black conservatives to denounce the violence and call for unity at a press conference? No, the liberal biased mainstream media would not cover such a press conference. Non-victim-minded blacks do not fit the media-desired image of America. Blacks who love their country without resentment toward fellow Americans who are white are as repulsive to the mainstream media as showing Dracula the cross. Well, what about a racial peace rally – blacks and whites standing together, singing songs and talking about unity. No, Obama's SEIU thugs and/or the New Black Panthers could exploit the event by showing up to assault patriots. Remember Kenneth Gladney, the black conservative who was beaten and sent to the emergency room by SEIU thugs at a town hall meeting during the health care debates? Many believe Gladney's beating was in response to Obama White House's clarion call to “push back twice as hard” and get in the faces of those opposing Obamacare. The mainstream media will never tell the truth about black-on-white crime. When reporting incidents of black-on-white violence, the media walks a tightrope, bending over backwards to avoid mentioning race. And yet I heard a report on the radio in which the reporter, without hesitation, up front and in your face said five “black” men were shot by a “white” male in a white pickup truck. This type of story fits the racist image that the media desires to portray of white America. According to the media, blacks are ALWAYS the victims and never the aggressors. What's your take on the George Zimmerman case? 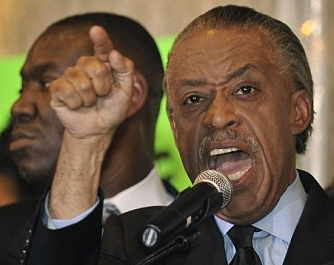 Is the State of Florida appeasing Black Panthers, Al Sharpton and Jessie Jackson? So how do we right-thinking, decent Americans counter all the racial hate, evil and violence, fueled by media and the Obama administration, that's contaminating our great country? Mary is away, up north visiting family. Thus, I found myself in the grocery store checkout line with my shopping cart one-third full. An elderly white gentleman in line behind me had two items. “Excuse me sir – you can go in front of me.” He gleefully replied, “Thank you very much.” After the cashier had bagged his items and given the elderly white gentleman his change, he thanked me again. I thought, that's it! For now, until God leads me otherwise, I can simply continue doing what I, along with millions of my fellow Americans, do every day: seize every opportunity to spread racial harmony and kindness. I know that sounds corny, but I know it is the right thing to do. Despite what the Race Industry would have you believe, a majority of Americans are not at each other throats, divided along racial lines. However, this is unquestionably the agenda of the Race Industry. Incidents of race related violence are on the rise since the Martin/Zimmerman incident. Most Americans are over “the race thing.” Americans live, work and play together just fine. Interracial marriage is far from being the big deal it was in the past. Unfortunately, it is the mission of the mainstream media, the Obama administration and race profiteers to keep the Race Industry alive and profitable. These people (race instigators and exploiters) are evil. Therefore, it is up to us – proud responsible Americans – to continue sowing seeds of racial harmony, brotherhood and peace.